Satisfied customers - thats what we're all about - cat dog or human! We have owned a Katz magnetic cat door for 8 months now. Our cat just loves coming and going and we are all enjoying the experience. We love the safety aspect as it protects the food and security for our cat. One of the best things we have ever spent our money on and the after sales service has been brilliant. 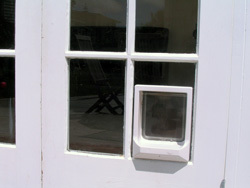 Kaz has put in catflaps and a bigger dogflap for my pets, in several houses, in the last few years. He is easy to contact by phone to discuss the cat/dog flap, he is reliable and on time for the installation,and tidies up the dust after the installation. I would recommend him to others. I will happily use his services again as required. I strongly recommend Kaz's services - prompt response, very knowledgable and efficient in installing the pet door. Offered a good range of options to choose from and gave great advice. Very neat and tidy job, and Kaz left the place very clean and tidy. Would definitely use him again! 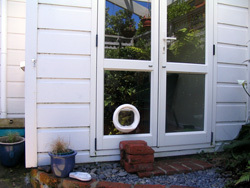 Katz is the pet door installation specialist for the greater Wellington region. In business since 1993, you can trust us to do a great job. We come to your home and install pet doors - we can even custom design solutions to meet more unusual needs! As we carry more than one brand we can suggest the best door for your situation - be it an electronic/magnetic door to prevent other animals entering your home or a door to blend in to your surroundings. 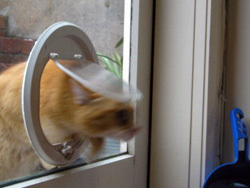 For homes where a traditional pet door can't be installed, ie: in safety glass, we may be able to create an alternative access point, such as through a wall. Catwalk Superior pet doors have been designed to be maintenance free by eliminating problems often associated with pet doors such as broken flaps, broken opening and closing systems, noise and sealdamage by pets, rusting screws and difficulties with large cats. To overcome these problems the cat flaps are made from high impact Polycarbonate (Makrolon) plastic from Bayer of Germany, a world leader in plastic technology. This high impact plastic is also used in the manufacture of bullet proof vests and aircraft windows. The G-CD model has been designed specifically for glass installation. The slim line design allows the door to be fitted into both single pane and ranch slider doors. They are available in both clear and white colours. This door may be fitted into a single glass panel by cutting a 245mm (9 5/8²) hole into the glass. NOTE:We do not advise installation by the home handy man, this is a job for your local professional glazier. 4-way locking system for manual use if required. In, Out, In & Out and Locked. Catwalk Superior pet doors have been designed to be maintenance free by eliminating problems often associated with pet doors such as broken flaps, broken opening and closing systems, noise and seal damage by pets, rusting screws and difficulties with large cats. Our wooden door model W-CD is designed to fit into external wooden doors or wall panels from 15mm (5/8²) to 53mm (2 1/4²). This model may be easily fitted by the home handy man. A major advantage of this door range is the upgradeability at a later date to the new Multi-Magnetic System should stray cats become a problem. All upgrade kits come complete with 2 collar magnets and may be purchased from your local supplier. Further collar magnets may be purchased if required. The all new Multi-Magnetic System has a similar action to that of electromagnetic doors, without having the problems often associated with these types of doors, such as battery or electrical failure. No batteries are required also eliminating ongoing running costs. This system is operated with ever-lasting Multi-Super Magnets. No maintenance is required other than the occasional clean. You may leave town without worrying about your pet being locked out or in due to battery or electrical failure. This is a unique feature of this patent pending door. A small magnet is attached to the pet collar, which activates the Multi-Magnets operating the opening latch to allow pet entry. Once the pet has entered the system will automatically close the latch. NOTE: Magnetic doors are designed for cats older than 9 months of age, we do not advise fitting magnetic collars to kittens. We do not advise installation by the home handy man, this is a job for your local professional glazier. The all new Multi-Magnetic System has a similar action to that of electromagnetic doors without having the problems often associated with these types of doors, such as battery or electrical failure. This system is operated with ever-lasting Multi-SuperMagnets. No maintenance is required other than the occasional clean. You may leave town without worrying about your pet being locked out or in due to battery or electrical failure. This is a unique feature of this patent pending door. Our wooden door model W-CD is designed to fit into external wooden doors or wall panels from 15mm (5/8²) to 53mm (2.1/4²). This model may be easily fitted by the home handyman. NOTE: Magnetic doors are designed for cats older than 9 months of age, we do not advise fitting magnetic collars to kittens.